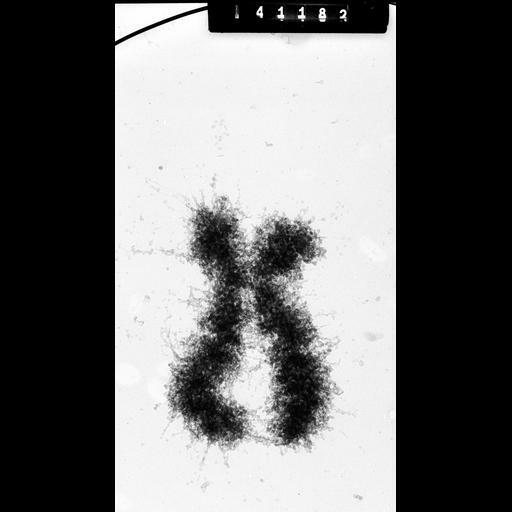 Whole human female metaphase chromosome from metaphase arrested cell swollen in hypotonic medium and imaged at 1 MeV. This image was taken with a specimen tilt of 55 degrees. Grouped with it is an image of the same area at 45 degrees tilt, providing an oblique stereo view of the chromosome. HeLa cells were metaphase-arrested by a 3hr treatment with colcemid, the cells mechanically broken by passage through a 22-gauge needle and exposed to hypotonic 75 mM KCl for 10 min. Samples were fixed with 3:1 methanol:acetic acid, squashed in 45% acetic acid, transferred to a formvar coated grid, critical point dried, and imaged with the Wisconsin HVEM at 1 MeV. See Ris (1978) Preparation of chromatin and chromosomes for electron microscopy. Meth Cell Biol 18:229-246; Ris (1981) Stereoscopic microscopy of chromosomes. Meth Cell Biol 22:77-96.